The Chicago bicycle injury attorneys of Rosenfeld Injury Lawyers LLC are dedicated to finding justice on behalf of anyone who is injured due to the actions of another person. While Chicago has become a very friendly city for bicyclists, it is also true that the city is a very dangerous place for anyone who chooses to ride his or her bike on public streets if the proper precautions are not taken. Understanding the different types of bicycle accidents can help drivers and cyclists be better prepared and act in a more defensive manner when traveling in an effort to reduce the number of catastrophic injuries to cyclists. It is important to understand that you are required to follow all of the same rules (and then some) when sharing the road with motorists. Riding a bicycle does not give you the right to ignore traffic signals or cut in front of traffic that has the right of way. Disputes over who had the right of way are extremely common following bicycle accidents and our Chicago bicycle accident lawyers can help you determine who was at fault or whether comparative liability laws can assist you in the recovery of compensation you will need to pay your medical bills and other financial losses you incurred due to your accident. The following types of accidents are caused by the failure of one party to yield the right of way. Collisions at intersections with stop signs— whenever you are riding a bike on the street, you must treat every traffic control device as you would behind the wheel of a car. This means stopping at stop signs and allowing cars to pass if they have the right of way. Most accidents at these intersections stem from multiple interpretations of who has the right of way. In many of these cases, the liability is shared because both parties contributed. The best way to avoid this type of accident is to always look in all directions at intersections to be sure that vehicles are going to give you the right of way and to position yourself farther to the left so that drivers have a better chance of seeing you. Collisions at uncontrolled intersections— when two vehicles approach an intersection at the same time and there are no signs or lights present; the vehicle that reaches the intersection first is afforded the right of way. Drivers may not always feel amiable about allowing you to pass, however, so it is much safer to slow down when approaching the intersection and be prepared to stop. Collisions at stoplights— if you are at a stoplight and decide to cross before it turns green, you are responsible if you are hit by an oncoming vehicle. If you have a green light, however and are hit while crossing, the driver may be held liable and required to provide compensation for your injuries. The left cross— the left cross accident occurs when a left turning vehicle crosses the path of a bicyclist who is crossing the road. Since left turners must yield the right of way, it is almost always the motorist’s fault when this type of accident occurs. There are still ways you can make yourself more visible to drivers and avoid this accident, however. Wearing bright colors, using reflective gear at night, and moving farther to the left will help make you more visible, and some experts even suggest taking the middle of the lane at an intersection as if you were a vehicle. This is up to your discretion, as this tactic may disturb traffic behind you. The right hook— this type of accident occurs when the bicyclist is positioned on the right side of the road and a vehicle making a right turn makes the turn into the cyclist. It is almost always due to the failure of the driver to notice the bicyclist and an example of why you should move farther left when you are riding. It is better to be seen and considered a nuisance than to not be seen and struck by a negligent driver. There are a variety of factors that contribute to every accident and while right of way is a common factor for many bicycle accidents, it is not the only cause. The following types of accidents are almost always the fault of the motorist due to negligence or reckless behavior. Dooring accidents— these accidents occur when a driver decides to exit his vehicle without making sure that the area to the side of his or her car is not free of traffic. The bicyclist has very little time to react and strikes the door of the car. 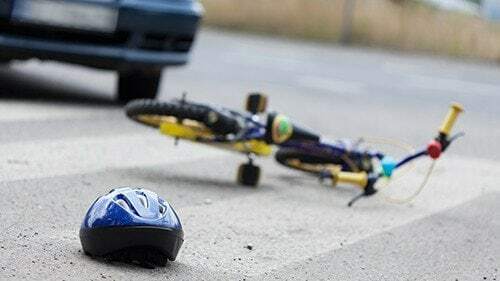 The injuries sustained in these accidents can be severe, as the cyclist is often thrown from the bike and exposed to sharp objects and debris. Drunk driving accidents— drunk drivers are responsible for about one-third of all traffic-related fatalities. They are more likely to be speeding and not to notice the bicyclist, which may result in more serious injuries to the cyclist or a greater chance of death. Distracted driving accidents— smart devices continue to be a steady source of distraction for drivers. The decision to pay attention to a text message or a smart phone app rather than the road can prove fatal for both the driver and whoever he or she happens to collide with. When the victim is a bicyclist, the results can be catastrophic. Read end collisions and side swipes— drivers often misjudge the amount of space that they have between their vehicles and the bicycles that they attempt to pass on the road. When this is the case, they may strike the bicyclist from behind when passing or not stopping quickly enough at an intersection. Regardless of what role you may have played in an accident, it is important to document the events that transpired by securing witnesses and photographs of the scene. Even if you share fault, you still may be able to recover damages for the other party’s role in the accident. Never admit fault in an accident and always speak with an attorney prior to entertaining any offers of settlement by insurance companies. Rosenfeld Injury Lawyers LLC has offered expert legal services to thousands of clients who have been injured in bicycle accidents. Our team includes medical professionals, accident reconstruction specialists, economists, social workers and qualified attorneys that specialize in cases similar to your own. We can help you access the medical treatment that you need and ensure that you recover the maximum amount of compensation available under law for your injuries. Contact us today to arrange a free consultation with one of our award-winning Chicago bicycle accident attorneys so that we can gather all of the information we need to begin investigating and building your case. We will explore all of your legal options with you and let you know what it is that we can do to increase your chances of a successful recovery. Our attorneys work on a contingency fee basis, which means there is no risk for using our services and you will never be required to pay attorneys’ fees if we are unable to recover damages on your behalf.